What can owner focused construction software do for you in 2018? Accurate and real-time information of the status and progress of construction projects are the prerequisites for smart construction management. One way to monitor and manage these projects through reporting is to use a project dashboard. The anecdotal, long, and tedious reports can make the decision makers overwhelmed with too much information, and they can get frustrated in finding one or two pieces of useful information from the exhaustive reports. A construction management dashboard represents the project reports by converting the compound project information into charts and graphs. Most people learn better visually and interpret and retain the content much more efficiently. Graphs turn raw data into easy to understand pictures for a quick examination. Especially when it comes to complex data, there's no better way to express compound information than through graphs, charts, and diagrams. 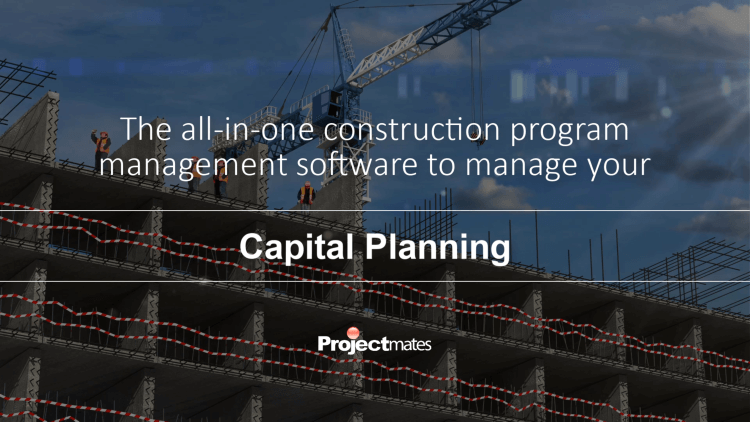 Projectmates Capital Construction Management Dashboards equip project managers and executives with the right tools needed to keep precise and real-time information about their projects. These reports provide an overview of the projects and help them in making intelligent decisions. Projectmates Dashboards can measure the performance of the projects on different parameters such as cost per project, change order amount by reasons, overdue schedule items, and much more. All these ensure that the owner is in control of his/her projects at all times. The owner can track all progress and effortlessly locate any pitfalls in each project. Dashboards that have the ability to give a high-level overview of everything depict large amounts of data graphically, providing real-time snapshots that are quick and easy to comprehend. Projectmates' Dashboards give at-a-glance business intelligence and also help construction managers to understand the trend of progress for the project up to the evaluation date. It becomes easy to evaluate project statuses and quickly identify at-risk and under-performing projects. At-a-glance project status: The dashboard summarizes vast amounts of information in easy-to-read charts and graphs. Easy Insight: It is easier to interpret and comprehend data than to understand a bunch of numbers. The management can quickly make out how the projects are faring regarding time and budget. Intelligent Decision-Making: The management can readily recognize trends, compare the actual performance with the benchmark and plan their next steps. Reduced Risk: Dashboards prevents the projects from getting off the track by helping the executives to quickly identify at-risk and under-performing projects and take corrective action at the right time. This improves the overall performance of the projects. Not only this, the Projectmates Dashboard is automated to extract data from the various modules like the cost tracking modules and eliminate double entry and reduce error in keying the values into the dashboard. There are dozens of predefined reports to gives executives a bird's-eye view of projects so that they can keep close tabs on progress. 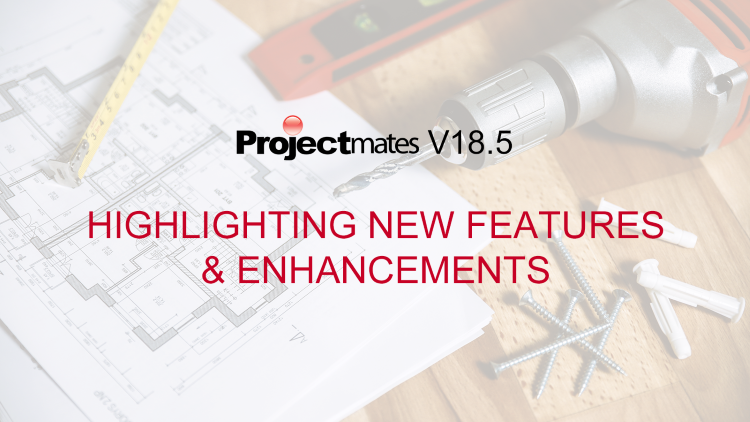 Projectmates allows users to build their custom reports, with drag and drop functionality, features like grouping and summarizing of data, and advanced filter logic. Ad-hoc Reporting offers a robust drill-down capability that enables the management to find out the actual reason for the under-performing projects. Projectmates Dashboard and Reporting are powerful tools that help in managing the entire project portfolio as a whole and not just an individual project. They can produce a variety of reports like that for Construction, Workflow, Financials, and Project Status. Monitoring and managing projects through these smart tools save the project management team valuable time in reviewing extensive project status reports and aides in informed decision making, reduced risks and hence leading to better project outcomes. Expect more from your construction management software, and have an easier time conveying overall project health. With Projectmates Dashboards you can quickly create an executive snapshot of live data, summarize vast amounts of information in easy-to-read charts and graphs, create dashboards based on user-defined reporting criteria, export charts to PDF, JPEG, and other formats, and evaluate program statuses and quickly identify at-risk and under-performing projects! Learn more today by requesting a demo.